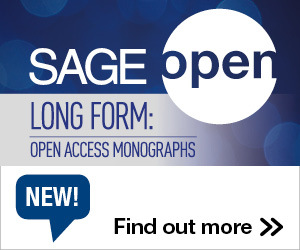 As open access begins to enter the mainstream of scholarly communication, we need to monitor carefully how it is working in practice. ‘Gold’ open access, the publication of OA articles in journals, is becoming more common, and since it is often funded by pre-publication article-processing charges (APCs), we need to be fully aware of its costs as well as its benefits. This is particularly the case since the Gold model is favored by a number of research funders in the UK and elsewhere (including Research Councils UK and large medical research charities, such as Wellcome), who make funds available to their grant holders to pay APCs. These researchers, and others, are now paying APCs not just to fully-OA journals, but also to the increasing number of subscription journals which also offer OA options for articles (the ‘hybrid’ OA model). Whilst some people have suggested that the hybrid model may act as a transition mechanism to move subscription journals to open access, such a transition will only work if, as income from APCs rises, subscriptions are reduced commensurately (so-called ‘offsetting’). If that does not happen, then academic institutions will end up paying more – supporting both the traditional subscription model and the OA model simultaneously. This article by Stephen Pinfield originally appeared on the LSE Impact of Social Sciences blog as “Gold open access in practice: How will universities respond to the rising total cost of publication?” and is reposted under the Creative Commons license (CC BY 3.0). Concern is now growing in the higher education community that this is exactly what is happening – that the “total cost of publication” is rising for institutions and that this is due to publishers “double dipping”. “Double dipping is the term used to describe a publisher gaining from two income streams, APCs and subscriptions, in a way that its overall income from the same customer rises” – that is how I and my colleagues at Sheffield, Jennifer Salter and Peter Bath, defined “double dipping” in a recent paper which focused on examining ways in which higher education institutions are implementing Gold OA (Pinfield, Salter, & Bath, 2015). We took as our starting point this concern and also an important phrase used by the former UK Science Minister, David Willetts: the “total cost of publication.” Willetts described the total cost of publication for HEIs as: APCs, and the costs of administering them, plus subscriptions. We wanted to find out more about what the total cost of publication currently looks like for academic institutions. Working with Jisc and Information Power Ltd, we gathered data from 23 UK higher education institutions (HEIs) comprising their APC payments, costs of administering APCs and subscriptions. From these data we were able to learn a great deal about the current state of the APC market and also carry out some modelling on the total cost of publication for those HEIs. We wanted to do this work to help build an evidence base to inform ongoing policy development and future negotiations between HEIs and publishers. We wanted in particular to find out what institutions were actually paying, not just look at list prices. We found that APC payments in the UK have really taken off since 2012 (the year the RCUK policy kicked in), with payments by the 23 HEIs rising from less than £1 million in 2012 to more than £4 million in 2013 (see Table 1). Table 1. 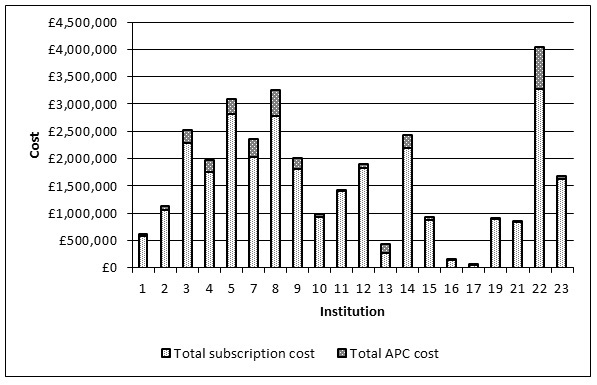 Total number and cost of APCs per year for the 23 institutions, 2007-2014. Source: Pinfield, Salter & Bath (2015). Partial data for 2014 indicated payments were set to continue to rise – something which has subsequently proved to be the case (judging by the most recent data we are analysing right now). All of this was happening at a time when the mean APC price paid by institutions remained pretty stable, at an average of £1,682 between 2007 and 2014. At the same time the range of APC prices paid by the HEIs varied enormously, with the lowest payment less than £100 for an APC and the highest, over £5,000. Even APC payments made to single publishers varied considerably. There was, however, a marked difference between prices paid to fully-OA journals and hybrid journals. This was an important finding of previous work carried out by Bjork & Solomon based on an analysis of list prices. Our study, based on what HEIs are actually paying, corroborates their finding, with a five-year mean APC between 2010 and 2014 for fully-OA journals published by non-subscription publishers being £1,136 compared with £1,849 for hybrid journals. We also found that it is traditional subscription publishers that are now capturing most of the APC market. The top-10 publishers in terms of numbers of APCs received from our participant institutions (who received 76 percent of the total APCs paid from our sample) only included two fully-OA publishers (PLOS and BMC). The others were established publishers (Elsevier, Wiley, Springer and so on) who are mostly gaining APC income from hybrid journals. Because HEIs also gave us their subscription data, we were able to model this against APCs to calculate their total cost of publication. We had sufficient data from 20 institutions to model their 2013 APCs paid to hybrid journals (2,347 of them) against 2013-14 subscriptions to those publishers. 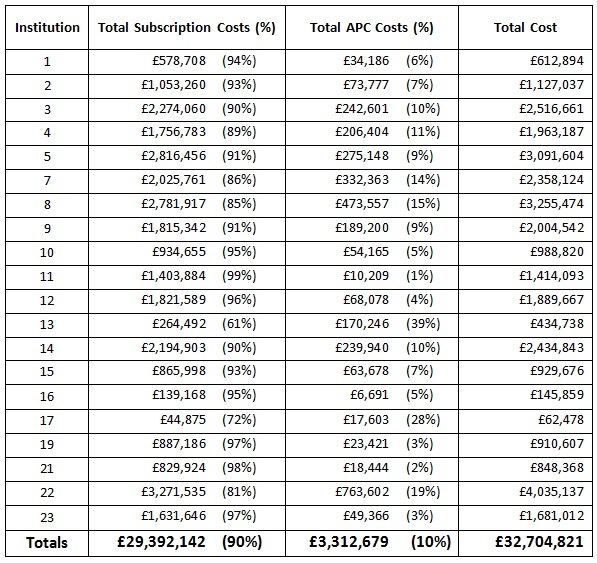 We found that overall the total cost of publication for those HEIs (excluding admin costs) was £32.7 million, of which £29.4 million was for subscriptions (90 percent) and £3.3 million for APCs (10 percent) (see Table 2 and Figure 1 for the distribution across institutions). APCs were then already 10 percent of the total cost of publication. Table 7. Total Cost of Publication, 2013 (excluding administrative costs) for institutions. Figure 1. Total Cost of Publication, 2013 (excluding administrative costs) for 20 institutions. We excluded admin costs from our modelling because the data we collected did not give us a clear enough picture of them. However, a study that I have subsequently completed with other collaborators, Rob Johnson and Mattia Fosci of Research Consulting Ltd, reports detailed costings for Gold (and Green) OA admin in HEIs (Johnson, Pinfield, & Fosci, Forthcoming). The study (based on data from 29 UK HEIs) estimated average admin costs for making outputs available via the Gold route to be £88 per article. If that figure is simply fed into the above total cost of publication calculations, it adds £206,536 to the total, and that constitutes (only) about 1 percent of the total cost of publication. Overall, this means that subscriptions were 89 percent, APCs 10 percent and admin costs 1 percent of the total cost of publication. Our research does, however, show that complying with funder mandates adds further cost, since activities such as advocacy, policy development and reporting need to be taken into account in addition to simple admin costs. These additional costs do not form part of the total cost of publication calculation, but are nonetheless significant, with the cost to UK research organizations of achieving compliance with the Research Councils UK policy alone being estimated at £9m per annum. Johnson, R., Pinfield, S., & Fosci, M. (n.d.). Business process costs of implementing “gold” and “green” open access in institutional and national contexts. Journal of the Association for Information Science and Technology, (In press). So is the total cost of publication rising overall? In the short term at least, the answer is certainly ‘yes’. Whilst some publishers may have offsetting arrangements in place, these do not often cover the full additional costs for individual institutions moving ahead rapidly with Gold OA. Others do not have any offsetting arrangements at all and, in any case, institutions are normally in multi-year subscription agreements with in-built price rises. APCs are adding to the costs. More work is certainly needed in this area to continue to build the evidence base and to monitor current developments. All of the collaborators mentioned in this blog are now working together in a project funded by Universities UK, led by Research Information Network, and also involving Elsevier, to monitor open access development in the UK. We are due to report our findings later this year. As part of this, the Sheffield team will be updating and enlarging our research on the total cost of publication. We hope that this work will feed through into policy development in the UK and elsewhere and also will enable negotiations between HEIs and publishers to happen on an informed basis. It is becoming increasingly clear that these negotiations need to take into account the total cost of publication (or ‘total cost of ownership’, as Jisc are calling it), wrapping up subscriptions, APCs, and any other relevant costs (colour and page charges?) into single deals. Such an approach will ensure that institutions’ concerns about double dipping are allayed and enable the academic community to get best value from its research outputs. At the same time, business processes and technologies will also certainly need to be improved in institutions (and publishing houses) to make the whole system work more efficiently. There are major challenges here. And we will need to continue to review how Gold OA works in practice. Of course, Gold OA is not developing in a vacuum: there are also additional challenges in understanding the ongoing relationship between Gold-related initiatives and Green OA (deposit in repositories). Open access repositories show every sign of also being important part of the future scholarly communication infrastructure, but their relationship with Gold OA in policy and practice remain important points of debate, discussion and experimentation. This is particularly the case in the UK now that some funding agencies (RCUK and medical charities) have in place policies emphasizing Gold OA, and others (the Higher Education Funding Councils) favoring Green. 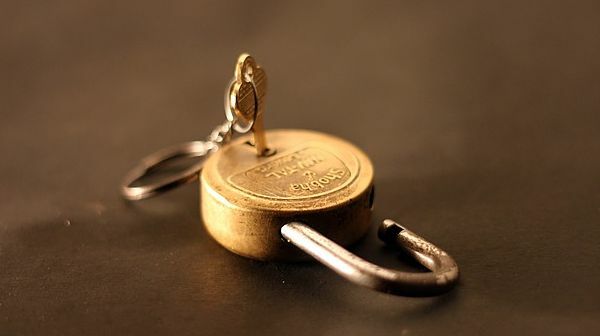 Now that it is becoming clearer that open access is entering into mainstream, we need to begin to develop a stronger evidence base around these key issues that can help us ensure developments create benefits in the academic community and beyond. The author would like to acknowledge the ongoing assistance of Jisc in carrying out this research and the work of Information Power Ltd in gathering data on behalf of Jisc in 2014 that formed the basis of the paper by Pinfield, Salter and Bath. The paper by Johnson, Pinfield and Fosci was based on a study initially carried out by Research Consulting Ltd (led by Rob Johnson) and funded by London Higher and SPARC Europe, Counting the costs of open access. This entry was posted in Open Access and tagged Article-processing Charges, Gold OA. Bookmark the permalink. Post a comment or leave a trackback: Trackback URL.